Reference to our conversation on skype earlier today, I thank you very much for the privilege which you have giving me to write this business proposal and the cooperation which you have shown to me. After my chat with you, I went immediately and told my family about your kindness towards me, which they are all happy with you. I want to let you know that our greatest dream and aim in life is to buy a house, relocate and settle in your country or any other Asian and European countries of good political stability with my entire family where we wish to start-up an investment. With the fact that we have not known each other before, but the little manner and corporations which you have shown to me on Skype made me and my family have good confidence and trust in you to explain and inform you of my family business transaction. I am assuring you that there is no risk involved provided that you follow our instructions during this transaction. Please read this message very well for your understanding. As I earlier introduced my self to you, my name is Mr. Ahmed Baah-Wiredu, i am political activist, also working in the ministry of agriculture. A member of National Patriotic Party (NPP) executive committee in Ghana and my father is the former minister of Finance and Economic Planning in Ghana, Hon, Kwadwo Baah-Wiredu, who died on Wednesday, September 24, 2008, after he had undergone a medical surgery in South Africa. Months before my father died, he deposited US$14.Million United States Dollars in a private Safekeeping Company Vault here in Accra-Ghana pending when the fund would be needed. I, as the direct first son would be responsible for accounting of my late father's financial transaction within the family circle and I don't want this amount to be discovered by the new government, this is my reason in needing your cooperation to move this money out from my country to abroad for safety and investment purpose. My aim of contacting you is to crave your indulgence to assist me and my family to secure this fund abroad for safekeeping on my behalf and the family, which my father incidentally kept to finance the 07th December 2008 election, unfortunately he died before the election date. But the good news is that my late father did not disclose the real content to the Safekeeping Company Authorities; he only told them that it was Precious Family Treasures, gift meant for his foreign business associate for safety of the money not to be tampered until when we are ready to make use of it for the political programs. So no body knows the real content as cash money but only my family knew. One more thing, the present government is bringing down on the opposition and trying to trace all the funds that belong to them, which if they succeed in tracing this fund from us, they will prosecute us and confiscate the fund. Base on this my mother and uncle advised me to look for a foreigner that will be reliable and trustworthy to assist and Stand as my late fathers foreign business partner whom my father made the deposit on his behalf to claim the Box as precious items from the Safekeeping Company Authority and move it to his country for investment purpose in other to avoid any trace from the ruling government. Please Sir, all I need from you is an assurance that you can handle the amount involved Fourteen million United States dollars only (US$14,000.000.00) comfortably and that I can also trust you with this arrangement. We the entire families have agreed to reward you with 25% of the total amount after the transaction and we also to give you the post of our foreign investment manager with 15% of our annual profit. Please respond and tell me your willingness about this request so I can furnish you with other necessary informations. (1) Your full name and address. (2) Copy of your National ID card or Drivers License. (3) Your Company name and your Position. (4) Phone and Fax numbers for easy communications. Immediately I get all this informations I will not hesitate to proceed with other necessary information's and procedures. Thank you once again and hoping for your kind responds. How are you and your family? 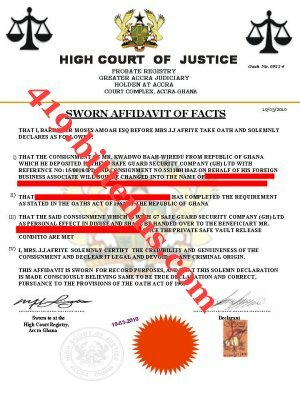 I received those documents from the lawyer this morning, he was requested the sum 500 Euro before he will send the affidavit document to the head office of G7 Security Company in Accra Ghana in order to release the box and also deliver it to you. Brother, am too worried about this project and delay is dangerous, we have no much time and the lawyer is waiting for your payment confirmation before he will proceed for the shipment, the security company has already arrange with they diplomat for the delivery only that they are waiting for your payment through the lawyer. Send the money to the lawyers name below through western union to quick the process as it confirms same day, moreover that will enable him to conclude with the company and also deliver the box to you. This is the Lawyer contact information.